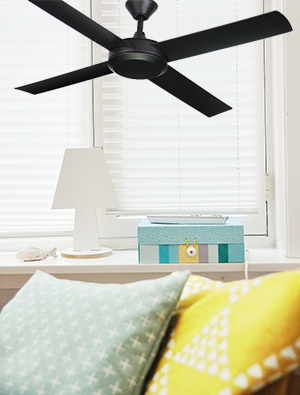 One of the hottest trends in ceiling fans this spring is black fans. Youmight have seen them featured on house renovation TV shows but now you can takethis trend into your own home. black colour is a dramatic contrast to a white ceiling and compliments nicely with monochrome furnishings. Black and white is classic but simple and can easily work in any home. Black fans also look stunning in a room which features raw brick walls, timber floors of feature walls, or an area with glossy tiles or bench tops. Fortunately, adding a black ceiling fan is an affordable way to update your space and to save you energy and keep you cool inthe summer months. Beautiful and functional… what more could you ask for? If you need a light, there is an option with a light as well. 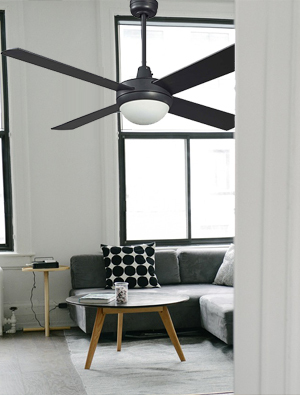 Shop now for the hottest trends in ceiling fans this spring is black fans. You might have seen them featured on house renovation TV shows but now you can take this trend into your own home.